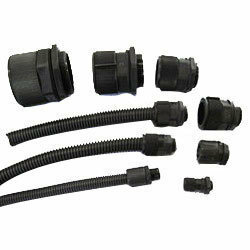 We at S.S.SON CONTROLS ( Mumbai ) are leading suppliers of Plastic Spiral Conduit in India . These conduits are made out of PVC Material . grey, flexible plastic spiral conduit. The jacket is made of PVC-P with an integrated hard plastic coil made of PVC-U. Our presented series of Plastic Conduits is enormously demanded in the market for their long-lasting nature and superior finish.